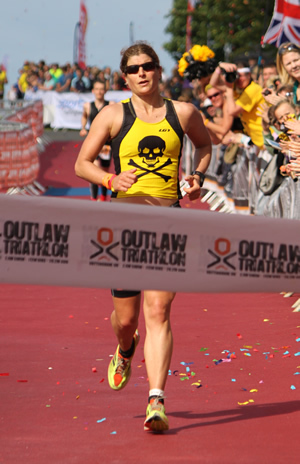 It was third time lucky for Emma Rand when she won the Outlaw Triathlon in 2012 having also raced in 2010 and 2011. She finished 3rd in 2010. The University of York lecturer had a major accident over the Christmas period this year, so she’s back in 2013 with some slightly different goals, and some excellent race tips that are definitely worth taking note of! The 42 year old got into triathlon by reading a copy of Ultrafit Magazine in the early 1990s and an article about Ultraman Erik Seedhouse. This is where she got the idea of doing an Ironman and turned the dream into reality at Ironman Frankfurt in 2006. She’d entered another one before the DOMS had faded and now races regularly at the distance. What was it like to cross the finish line in first place? What is your main strength in triathlon? You career highlight so far? Your ultimate goal in tri? We hear you had a bad accident over the winter? So you’re returning to the Outlaw this year, what are your goals? What's your nutrition plan for the Outlaw? You’ve been to the Outlaw all three years so far, what are the top three things you’ve learned? 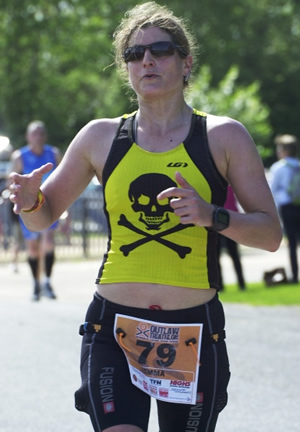 “There are some things that apply to all races like pacing and nutrition, but specifically for the Outlaw I would say it is good to take it easy out of the lake. The first bit of the bike is around the Lake side so it is fairly busy when you are a bit adrenaline charged out of T1. There is no need to rush. Don't plan to have to do anything like eating or drinking or fiddling with your Garmin for the first couple of kilometres as this is when it is easy to have an accident. What are you looking forward to most about the Outlaw? Are you camping or staying in a hotel? What’s an average training week for you? What are your tips for balancing work and training? Your tips for the 51 novices doing the Outlaw this year? Do at least a sprint to practice! It just gives you an idea how to organise yourself on the day. Otherwise, try not to think about times during the day, focus on the process and have process related goals like checking your effort level every half an hour, making sure you follow your eating and drinking plan and are able to assess and make changes as you go. For example, if you don't need a wee at some point during the bike there is a high probability you aren't drinking enough. If you feel tearful or emotional you may well need some more fuel.